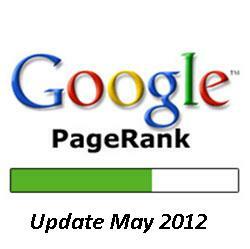 Google PageRank Update May 2012! Google's latest PageRank Update May 3rd 2012, which has just been rolled out, has given bloggers all over the internet something to say and think about. For some, it came as a pleasant surprise, as their PR increased, while others were shocked to see their PR drop as a result of this update. Indeed, we weren't expecting an update until June, but PR is updated every 3-4 months, so it didn't totally come put of the blue. It was just a minor update, as Google has already been implementing changes in the last few months. Amid high anticipation among bloggers, this update benefited more blogs than it harmed. After this update, PR for MBT remains the same. But there is good news! The PR for our sister blog Smart Earning Methods jumped directly to 2 from 0! So as a treat for our readership at SEM, we have opened up guest posting on SEM, and we have already received some guest posts! You can submit one too now! What is Google PageRank and How does it work? For most savvy bloggers, this is nothing new, as they have spent time in the past worrying about the next PR update. But for new people,bloggers, or for those that don't know, Google PageRank is a rating of your webpages on a scale of 0-10, with 10 being the best rating. Google rates itself at PR 9. It is updated every 3-4 months. The last update was in February 2012, while the one before that came in November 2011. So There's been a three month gap for two or more times in a row. Hence, the next update is expected in the first week of August, although Google never releases a fixed date for this update. As to what Google PR actually is, it basically is Google's way of ranking pages and giving higher priority to better quality pages. A few years ago, spam blogging was on the rise. Spammers used automated bots to comment on other blogs, with links to their own blogs. This increased their inbound links and hence gave them better priority than quality websites. As a result, Google introduced updates and this ranking system so that quality websites are given higher priority. The Google PageRank takes into account many factors,some of which are backlinks, content quality, content quantity, SEO, and more. Watch the video below which explains how PR works and how it is updated. If you haven't checked your PR already, then what are you waiting for?? Get on with it! Go to the PR Checker Tool, and write your blog URL there. You will need to fill in an anti-bot captcha before you can find out your PR. How to improve your PR? Build backlinks - PR is mostly based on the number of incoming links to your blog, and the quality of those links. There are various methods for increasing backlinks, such as Guest Posting, article marketing, forum participation, etc. Always try to build genuine backlinks, and never purchase backlinks, because these are low quality links, and they do more harm than good. SEO - Search Engine Optimization is very important as well. You want to make it easy for Google to find and index your blog. For more information about SEO, check out our 20 Hot Seo Tactics every blogger should know. If you are on the wrong side of this update, and if your PR has dropped, chances are that you are doing something wrong. Handing out many backlinks to other blogs when you yourself have a few incoming links can be a major reason. Not to worry though. This isn't the end of the world! You have the next three months ahead of you to make the most use of. Read our post on 3 Reasons Why Your PR is Not Increasing to learn on the job better. In so much short time(one and half month) my website wideinfo.org have given pr 4 ! Very interesting post and informative as well. my page rank also increased up to 1 from 0. I am going to buy a domain. I want to know whether my pr becomes 0 after buying domain ? sadly my blog, doesn''t be updated yet. Thanks to mohammad bro who considered my request upon writing the post about second pagerank update of this year. . :)Well i wish to inform my blogging friends that MY BLOG which was started exactly when smartearningmethods started, also achieved same pagerank of 2 :) and i wish gud luck for whoever experienced pagerank drop, please never loss the hope guys. . Thank you for this post! I read you dayly. I recently bought a domain for my blogger blog and was angry why my PR is still 0. Now it is 1, but Google indexes my site worse than before. Before I bought the donain, with the most used keyword for my site, I was at the begining of the second page. After the domain, I went at the middle of the third page. Two days ago I sent a sitemap and now, when my PR increased, my site is at the middle of the 4-th page. I am not sure I find the logic. It is good that I rely much more to Facebook fans, otherwise, I should be very discouraged now. can anyone tell me that does this update effected my rank because i was changing my template from 29 april to 2 may and all the tags were removed in these days so does this effected my page rank ????? In the recent Google pagerank update, I have seen the effect into internal pages of my blog. However, homepage's pagerank remain unchanged. No Brother PageRank Only Depends upon Backlinks And Quality.. Changing Tags Could Effect Your SEO but PageRank is entirely based on inbound links. as we saw in Matt Cutts View. My Google Page rank is same even after the page rank update. But after the penguin update my visitors are down to almost zero from about 3000 page views per day. My website( www.simpletaxindia.net) Page Rank is 2 and it remains in between 0-3 every time I have checked but irrespective of page rank my blog visitors are increasing day by day.I think page views are function of Good,useful and unique content and Page rank is also function of Good content so why to bother about it?. after installation of this widget 100 likes added in single day.Thanks MBT team . PR of one of my blog is decreased from 2 to 1 and I am worried about it. PR of our kidz cartoon website (www.urdukidzcartoon.com) has been increased from 0 to 2. Thanks google. we have launched this site in jan-2012. They have told us that PR is not an actionable metric, and there is nothing to be gained by gaming the system to improve your PR. PageRank takes into consideration the history of the site and the length of registration. New changes to the PR algo switched the basis of PR from the old method based on the PR of the linking page to one calculated on relevance between liking and linked pages. >"PR is mostly based on the number of incoming links to your blog, and the quality of those links." In the Mayday update Google changed this to the number of links on relevant pages. Great one. My inner page rank is increased from 0 to 2 but the Page rank of my homepage is still zero. So is it the minor change or the final page rank update? My page rank doesn't have any change.Till it remains on N/A .. lol .. But still im receiving good traffic. Great post. I got Page Rank 1 and hope in the next update it will 2 or 3.
how can my site page rank 1 or 2. Its true? please inform me. Advertising is the best method for getting high traffi & improve your website ranking. Because of its help to find your website in a seconds. When you give your advertise in others website, its works for your back ling. And a back link helps you for getting first place ranking of google, yahoo, bing and others search engine. Bestelance also include analytics tools for getting everyday instant traffic statistic. Nice! With the recent update my PR raised from 0 to 1! The best that happened to my site so far! Thanks Google! Chat Rooms, Best Pakistani Girls Chat Rooms, Best Indian Girls Chat Rooms, Chat With Pakistani Girls And Boys, Chat With Indian Girls And Boys. For some reason my blogs on blogspot all have a page rank of 0. I am not sure why. They have been around for years and the one gets a nice number of hits each day. I had a rank of 4 on http://ladytalksalot.blogspot.com at one point and then one day 0. It has never gone higer then 0 since then and I was wondering if it is because it is on blogspot. Does anyone know if this could be an issue? Good info, I hope I will get there soon. I been monitoring this site <a href="http://www.gchats.com>video chat</a> for 2 months and nothing yet. My page rank at http://www.50plusfinance.com hasn't changed in over a year. Why is that ? Oh! Mine remains the same at PR2, while sadly, my other PR1 site went back to PR0. Congratulations on your increase though! I already read your related post on why PR is not increasing, very helpful! I'll keep those in mind! Thanks. Thanks and now i'm surely gonna achieve something after this. I came here before and left comment about my ranking suddenly disappearing but now with new PR update my PR is 2; Feeling great. Can anyone tell me when i will get page rank in google and my global rank is around 160,0000. Good article, my Google PR is 0 still after the new website came out in April, up until 10th August we had 3,500 people on the site over a 2 week period then nothing. Was I just unfortunate that the update caused my pr to drop a huge amount overnight and I have to wait another 2 months to see whether we get any points on the board? Why is it that the pagerank of my blog still remains stagnant despite all my hardwork and the updates? The new pagerank is said to be rolled out by november so i wait and see how it goes. My website is just 3days new and i got a pagerank of 0.PR 0 may be assigned as a Google punishment. In most cases, though, PR 0 just means that the site didn’t have enough quality backlinks at the time of Google’s last PR update. Just wondering how come google give me page rank 0 so fast. I am expecting it willl give a page rank of NA. Page rank 0 is good ? I am looking for tips to improve my site, thanks to you I have better understanding now. Most of my sites has PR 1, better than 0 even I saw a few of other sites (own by my friend) has better visitors and FB like but has PR 0. Does visitors has direct influence on PR, compared to backlinks? I hope all of this tips are still effective nowadays, most especially Google is more strict today than before. Thanks for the tips. I will try to my blog. Everything seems fine yet no pagerank increase from 0 to upside.